Day of travel across the International Date Line. Arrive in Bangkok and transfer to your hotel, the remainder of the day is free at leisure. Overnight at the Majestic Grande Sukhumvit Hotel. Bangkok. Morning tour of the Grand Palace and Wat Phra Keo, one of the finest examples of an ancient Siamese court. 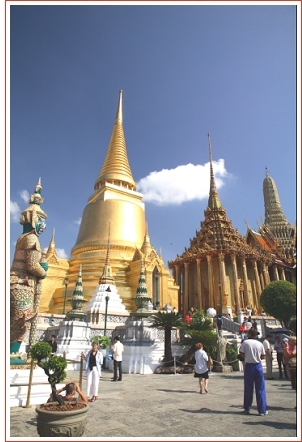 Home of the Kings of Siam of the Chakri Dynasty and originally built by King Rama I. Adjoining the Grand Palace you will find the Temple of the Emerald Buddha (Wat Phra Keo), it is regarded as the most important temple in all Thailand. With an early morning departure, you will travel 120 kilometres to Damnern Saduak floating market where boat people sell their wares from boat to boat or boat to shore. Return to the hotel just after noon. The remainder of the day is at leisure for personal activities. Thailand. Overnight at Sukhothai Ananda Museum Gallery Hotel. Early morning departure from Sukhothai to Lampang to visit Wat Prathat Lampang Luang with its Emerald Buddha and then continue on driving to Elephant training Camp of Lampang. After lunch visit Wat Phrathat Hariphunchai with its original from the 9th century. Drive to Chiang Mai Airport to board flight TG196 bound for Mae Hong Son. Arrival in Mae Hong Son and transfer to Fern Resort for accommodation. Trek on elephant-back to a Padong hill tribe village, followed by a private cruise on the Pai River to the Myanmar border. 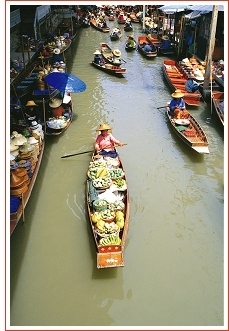 Here, after lunch, visit the village of Baan Meo, with dinner at a local restaurant. Overnight accommodation in Mae Hong Son. After an early-morning visit to a colorful city market and a chance to participate in the traditional offering of food to local monks, return to your hotel for a late breakfast. Visit Mae Hong Son's temples before boarding today's flight to Chiang Mai. On arrival you will be met and transferred to your hotel. Later this evening enjoy the delicious gourmet "Khantoke" food, the Northern Thai cuisine. . Overnight at Chiang Mai Empress Hotel. We invite you to join expertly presented Thai cooking lessons in a beautiful garden setting. The delicate blend of exotic herbs, spices, fruits and fresh ingredients makes Thai foods stand out as one of the world's most flavourful cuisines. Visit to the impressive Wat Doi Suthep, with its famous viharn (temple library). Proceed along a mountain road to visit a hill tribe village to see the Meo (Hmong) people living. Tour continues to Handicraft Village, to visit some artisans' workshops to observe the creation of Chiang Mai's most famous products. Later we visit Oasis Spa where to enjoy a relaxing 2-hour Aroma Massage Spa Treatment to relieve and relax your body. Transfer to Chiang Mai Airport for your flight to Bangkok and connecting service to Kuala Lumpur, Malaysia. Arrival meeting assistance and transfer to Equatorial Hotel. 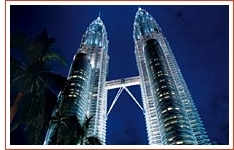 The morning city tour will bring you an insight of old and new Kuala Lumpur. Brief stops at King's Palace, the Petronas Twin Tower, the National Museum, the National Mosque, the National Monument and to the buildings at the Independence Square, the moorish-styled railway station. Today you will visit the historical Malacca where the Malay Sultanate started. You will see the cultural remains in the form of both cuisine and old buildings. Visit St Peter's Church (1710), the Portuguese Settlement, Porta de Santiago and the ruins of St Paul's Church. Tour continue to Melaka Museum, the Cheng Hoon Teng Temple and stroll along the antique street which ends by the banks of the Malacca River.